Harley Davidson Night rod special (VRSCDX ) (2006-current): Looks? Mean. A fighter? Yes, a mild one eventually. Engine: The liquid-cooled, fuel injected V2 60 ° Revolution 1250 c.c. engine (76.8 c. inches) delivers 123 bhp / 8250 rpm and 11.3 kg m / 7200 rpm torque, claimed values. A belt drive is used. Actually engine operation produces only slight vibrations and noise for the Harley-Davidson standards. Factory fitted mufflers produce a disappointing weak noise, for any rider ambitious to hear a vicious V-2 soundtrack. Engine revs are increased slowly compared to modern muscle bike standards, a little faster than average Harley standards. Engine performance is linear and mighty throughout the power band. A smile on the rider’s face will be curved above 6000 rpm. Under full throttle acceleration on average friction streets, sliding the rear wheel up to 100 Km/h (62 mph) is really easy, sweet and controlled. Its an easy task to achieve the speed of 200 Km/h, 124 (mph). Compared with the top muscle bikes, power delivered is satisfying, no thrilling. Compared with other Harley engines, top power delivery is really impressive, while the maximum torque is provided at twice the revs of the air cooled motors. Consequently, rider feels that this bike lies between two worlds. It is understandable why many fans of air cooled Harley engines were never fond of this one. The engine of the Night-rod, derives from the liquid-cooled V-rod bike that was introduced by Harley back in 2002. Engine was designed by Porsche. Riding position: The seat height is low, 690 mm. No matter the stature of the rider, he will step both feet firm on the road. The width of the Night - rod is moderate, the height of the bike is low. However the length of the bike is really great. Eventually due to the increased length of the bike and in particular the distance among the handlebar - saddle - pegs, only riders to the tall side may feel in harmony with the large dimensions required by the riding position. Average height riders will need to have their legs fully stretched to the front, which is not comfortable. Finally, the V shaped rider’s body should not be satisfying to burly riders. Rider is placed in and over the bike. Riding position is not normal nor racing. It is sporty, with room for improvement concerning comfort. 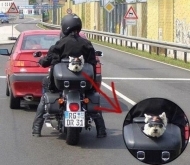 The Harley accessories can alter the riding position, e.g. placing the pegs closer to the middle of the bike. Again, rider will get used to this odd riding position, ride after ride. The bike feels heavy, 292 nominal dry kgs. This is not a problem for the rider due to very low riding position. On the road: The fork of the bike is too soft, the double rear shock absorbers are just soft. The only possible adjustment to the suspension is spring preload to the twin shocks. The factory fitted tyres are Michelin Halrey-Davidson Scorcher with dimensions 120/70-19 front, 240(! )/40-18 rear. Τhe Harley-Davidson emblem is curved on them. On urban rides, the Night rod is a big-long bike. This could be insignificant, if steering lock was not pathetic. Maneuvering the bike around traffic, will require some planning beforehand. On city traffic the Night rod gets hot when traffic is increased. The cooling fan will be heard very often then. The heat deriving from the engine will be sensed onto the rider's right leg close to the exhaust pipe, especially on hot climates. Riding then out of grill houses on the Night-rod, the smell of roasted meat may not be there because of nearby steaks! Conclusively the dissipated heat will be unpleasant for rider’s right leg, under these circumstances. Filtering will not be a problem, despite the height of the handle bar which is the same with that of car’s mirrors. Therefore an almost absolute bike is outlined, being satisfying only in leisure urban rides. On B-roads the handling is neutral, steering is towards the slow side. The bike follows a single line, throughout the curve. No line changes are prompted. Agility is better than the one expected from the huge wheelbase of 1715 mm. At the fast pace, ground clearance will soon result to a problem for the rider. Specifically it will be the heels of the rider that will be dragging on the street, the pegs will follow. At this pace, riding position is not really good for the rider to apply his weight on several parts of the bike. On low-average friction factor streets, feedback to the rider is relatively good. In case of road imperfections, rider will again be unable to apply some weight on the pegs, that is lifting some of his weight from the saddle, in order to reduce some of the strain to his back. Rider will feel the impact trapped, due to the riding position. On the highway stability is exceptional. Riding position soon becomes tiring. Riding position is fixed again, its like a sail against the wind in case of fast cruising! Air protection is negligible. Twin 300 mm disc brakes are equipped at the front, single 300 mm disc brake at the rear. Four piston Brembo ABS calipers and rubber brake lines are used. Braking is powerful, providing relatively good feedback. The fork is soft for emergency braking on decent streets. A considerable vibration may be felt by the rider on the front brake lever when the ABS is activated, which reminds of the initial ABS systems applied. It’s a very efficient braking system though, especially on low-average friction factor streets. The brakes at the bike reviewed were producing a duck caw sound, especially by the front. A special care has been given in order to make the ABS sensors discreet. Reliability: Engine is designed by Porsche, absolute top power performance was not a top priority issue. It’s a reliable bike. Quality build and finish are excellent. Model history: The Night rod was introduced in 2006, engine capacity was 1130 cc, the rear tyre width was 180 mm. As a matter of prestige and vicious design, a 240 mm rear tyre was equipped in 2007. In 2008 the engine capacity was increased to 1250 cc . Comments: There is no data provided at the company’s website concerning the maximum power performance, in bhp. The fast motorbike version of the American dream is a strong, rather low profile riding character, waiting for owner tweaks to be fully released. Design is distinctive, mean looks are overwhelming. Essentially it is a low, long and vicious looking bike resembling to a drag racing motorcycle, except from the riding position. The second reason for customizing is to attract even more attention, in case that less than ten people/hour are carefully examining the bike, wherever the Night rod Special is parked. - From 2011 onwards, riding is not top class, price is though.